This is the holiday season, a time to reconnect with loved ones and enjoy one another’s company and possibly have a relaxing vacation. But along with the sunshine, a little rain must fall. In this video, we look at how to protect ourselves and our loved one’s from the repercussions of bad things that can happen as we celebrate. The holiday season is here again. During this season, people tend to clock many more travel miles than at any other time of the year. Some travel back to their upcountry homes while others visit various holiday destinations. Due to the very high volume of travelers, this is the high profit season for the transport industry. Unfortunately, it is also the period when many road accidents occur. Some are caused by the reckless behavior of motorists, many in the pursuit of more profits as they try to make more passenger carrying trips and others seeking speed thrills. This season is also the harvest time for the criminally inclined. Since many people travel to see relatives and friends, many assume that they have brought lots of money and other goodies from the big cities to the villages. As a result, burglaries, robberies and car-jacking are at their peak during the month of December. These conditions significantly the likelihood of one incurring significant financial losses. Ironically many people still leave doors open to financial disaster as they go about celebrating the festive season. One of the most devastating causes of financial devastation is bills that accumulate as a result of medical services following either illness or trauma caused by an accident or criminal activity. Preparing and protecting yourself and your family from the vagaries of fate should be a permanent and ongoing part of your personal financial plan. The risk that you or one of your family members may incur heavy medical bills is one of the many risks in life, one that can cause you catastrophic loss and therefore one that must be managed in order to enhance your financial security. 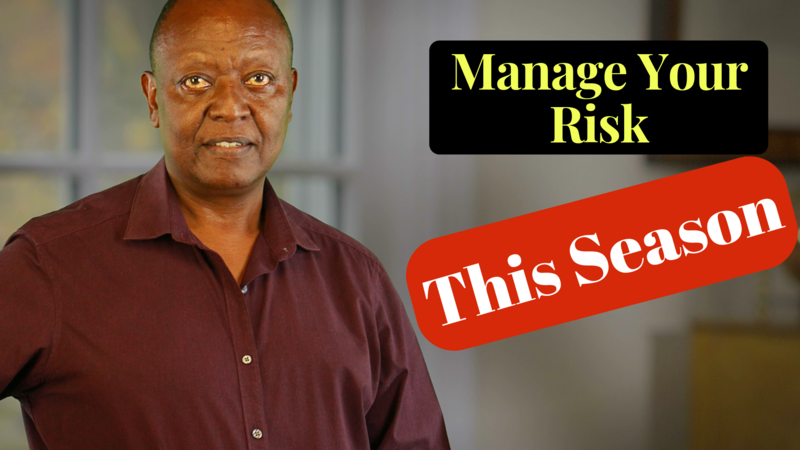 In managing any risk, one may use one or more of the following: risk retention, risk avoidance, risk reduction, risk sharing or risk transfer. Because of the possibility of catastrophic loss, you defi­nitely do not want to retain the risk. There is also no known way of completely avoiding accidents and criminal attacks and furthermore the only shared medical service is the limited government-provided hospital treatment. If you want proper medical care and the assur­ance that you will be able to pay for it, you have to use risk reduction and risk transfer techniques. One can reduce the risk of medical problems this season by avoiding physically risky activities such as drunk driving, and by driving carefully and servicing your cars. It is also obvi­ous that someone who engages in motorcycle racing is much more exposed to the possibility of being injured than a sedate jogger or golfer. However much we try to reduce the risk of encountering medical problems, we cannot to­tally eliminate it – but we can transfer it and that is what medical insurance is about. By buying appropriate medical insurance for yourself and your family, you transfer the risk of incurring heavy medical bills to the insurance company. By paying a small definite sum of money, you protect yourself from the possibility of a large loss. It is so important to have medical insurance that any discussion about it should be about where to get it and how much cover you should take, never about whether you need it or not. You do. is an important employee benefit, the fact that you are covered under an employer-sponsored medical scheme should not lull you into a false sense of security. Many of these schemes offer very limited cover and would not be much help if a serious illness is encountered. You owe it to yourself and your family to analyze the provisions of your employer provided scheme and decide whether you are adequately covered. If you feel you are not sufficiently covered, do not delay to buy addi­tional private medical cover. There are many medical insurance packages available. Some are offered by specialist medical insurance companies while others are products of general insurance companies. Most packages cover in-hospital costs including general ward accommodation surgeon’s, anesthetist’, and physician’s fees, operation theatre services, drugs dressings and other medical costs, the maximum total cover being determined by the premium paid. Some insurers pay direct to the medical service providers while others require you to pay and then they reimburse you. What costs are covered? What ailments are excluded? Do you have to pay the bills first then seek reimbursement or will the bills go direct to the provider? How long after you join do you have to wait before yon can make a claim? With some companies you may have to wait up to 90 days. Does the premium/cover compare favorably with other competitors? Is the company financially stable and does it have a reputation of honoring claims? Which hospitals are included in the company’s list and what is the procedure for admission? Some people feel that they have wasted money on medical insurance simply because they have never made a claim. This is not the case because having the cover gives you peace of mind as you know that should anything happen, you are covered. Consider it as the price of that peace of mind. Even as you enjoy the holiday season, visit relatives and look forward to ending the year happily, take care of the downside. Whatever you do, do not leave the back door open to financial disaster brought on by unexpected medical bills, manage that personal risk by having appropriate medical cover. In addition, be sure to insure your personal property. Let the merrymaking begin!